Brig Oubridge blows through a pipe to entice the camp fire to glow a little brighter, while Irene smoking a roll-your-own contemplates life. At hand is a box of The Original Cooks Matches, - just in case. 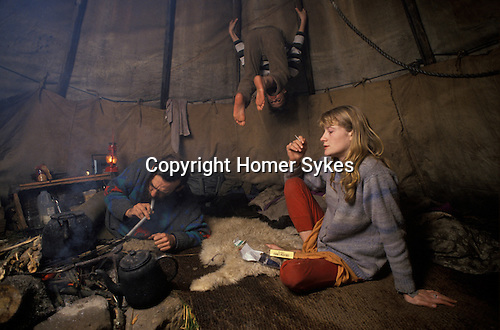 Kevin Oubridge hangs around upside down from the Tepee support poles. In 70 acres this eco friendly Welsh hippy community was home to around 120.